A new private rocket developed by an Internet millionaireis poised to make its launch debut from Florida on Friday, the first testflight in a bid to eventually send cargo, and possibly astronauts, into spacefor NASA. The new Falcon9 rocket, developed by Paypal co-founder Elon Musk, has cleared its finalhurdle ? a review of its emergency destruct system ? 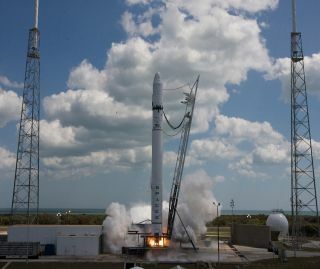 and is on track to blastoff from a seaside pad at the Cape Canaveral Air Force Station Friday around 11a.m. EDT (1500 GMT). The rocket was built by Musk's private spaceflightcompany Space Exploration Technologies (SpaceX) and will carry a mockup of aDragon spacecraft designed for cargo trips to the International Space Station. This SPACE.comgraphic shows how the Falcon 9 rocket compares with NASA's shuttles andother spacecraft. "Yeah, we?re all systems green right now," Musktold reporters today during a teleconference. "Weather is looking pretty good,although you never know where it will be tomorrow." Some scattered rain showers and thunderstorms areexpected, but SpaceX has a four-hour window in which to launch thenew rocket. If the Falcon 9 does not lift off by 3 p.m. EDT (1900 GMT),SpaceX can try again on Saturday, he said. And there's no guarantee of success. Musk said the chanceof the first Falcon 9 rocket launch succeeding is somewhere between 70and 80 percent. That's better than the 50-50 chances that accompany most rocketdebuts, but still poses a challenge. "This is very much a test flight of Falcon 9,"Musk said. "It's analogous to some beta testing of new technology." The Falcon 9 rocket is a two-stage liquid fuel boosterthat stands 178 feet (54 meters) tall and about 12 feet (3.6 meters) wide. Itshould take between eight and 10 minutes to reach a target orbit about 155miles (250 km) above Earth, Musk said. With NASA's space shuttlefleet retiring this year after just two more missions, the space agency hastapped SpaceX and another rocket builder to provide unmanned cargo shipments tothe International Space Station. SpaceX has a $1.6 billion contract with NASA to deliver20 tons of cargo to the International Space Station over 12 Dragon flightsthrough 2016. Musk has said the Dragonvehicle could be ready to launch astronauts into space within three yearsof getting approval from NASA to do so. NASA has also contracted another company, theVirginia-based Orbital Sciences, to provide eight cargo deliveriesusing the Taurus 2 rockets and their unmanned Cygnus spacecraft under a $1.9billion agreement. Earlier this year, President Barack Obama directed NASAto cancel its program building new rockets and spaceships to replace the agingshuttle fleet and directed the space agency to embrace commercial rockets andvehicles like those provided by SpaceX. That plan has received much criticism ? some aimed atSpaceX in particular ? from lawmakers and veteran astronauts like Apollo 11 astronautNeil Armstrong, the first man to walk on the moon. But others, such as BuzzAldrin (Armstrong's Apollo 11 crewmate), are in favor of the plan. Obamavisited SpaceX's Florida launch site and saw the Falcon 9 rocket during anApril 15 trip to visit NASA's nearby Kennedy Space Center. Musk said the debate around private spaceflight has addedsome pressure to SpaceX's Falcon 9 work, but it should not make Friday's testflight the fulcrum upon which the future of commercial spaceflight rests. "I feel sort of like a political punching bag orwhipping boy in that regard," Musk said. "Tomorrow's launch, or thenext day's launch, should not be the verdict on the viability of commercialspaceflight." SpaceX's Falcon 9 rocket is the second booster to bedeveloped by the Hawthorne, Calif.-based company. The first rocket, the smallerFalcon 1, made its first successful launch into orbit in 2008 after threefailed attempts. The most recent Falcon 1 rocket launched in the summer of 2009carrying a satellite for Malaysia ? SpaceX's first paying customer.